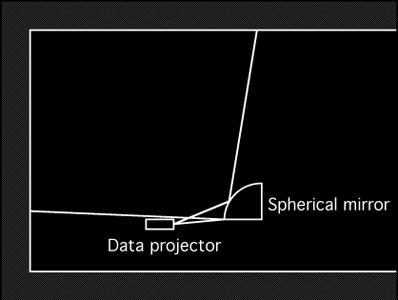 It is easy to imagine how a single data projector and a spherical mirror can scatter light through wide angles. 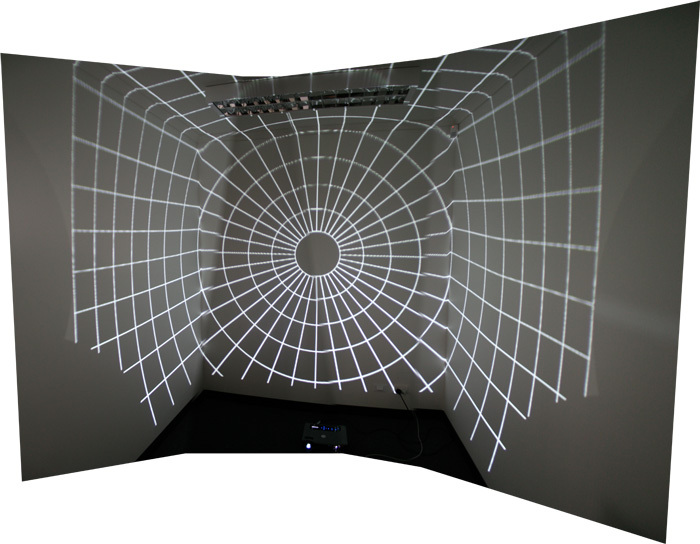 This can be used to provide a low cost projection solution for immersive displays where a wide field of view needs to be projected. 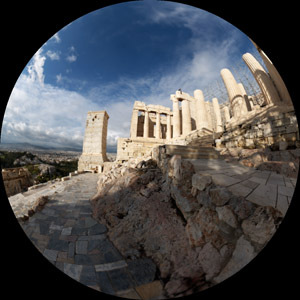 The more expensive traditional solutions employ a fisheye lens or multiple projectors with their images optionally edge blended together. 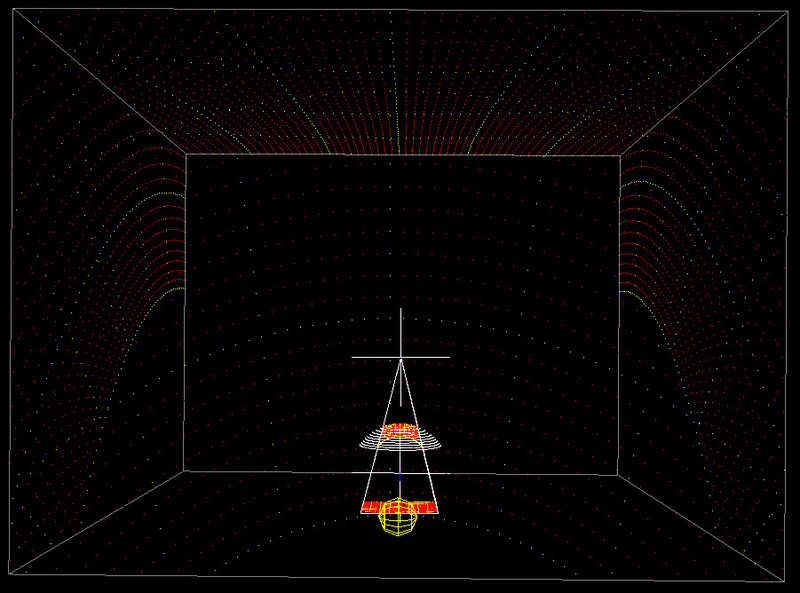 The light spread as shown here is derived by simulation software, all physical attributes of the environment are variables to the software including the observer position. 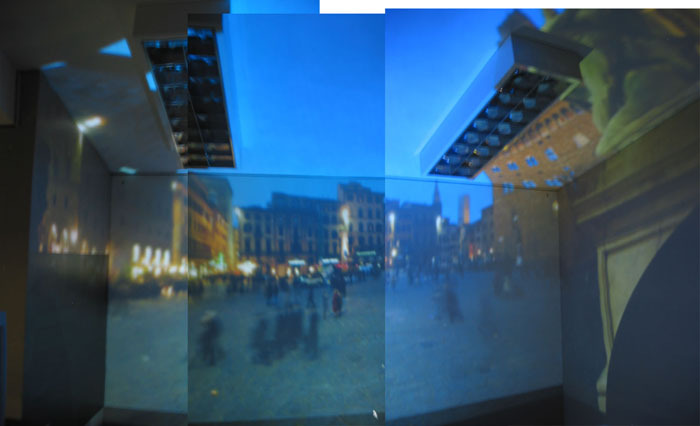 Some variables such as the projector/mirror attributes can be varied in order to decide upon the effective field of view (FOV). 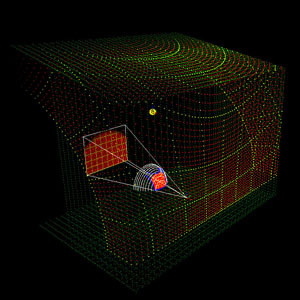 The output of the simulation software is the warping function required for a particular input image projection. 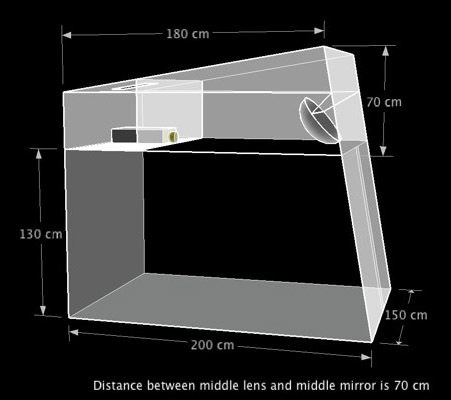 More or less of the wall surface can be illuminated depending on the relative distance between the projector and the mirror, also depends on the throw and zoom of the projector. 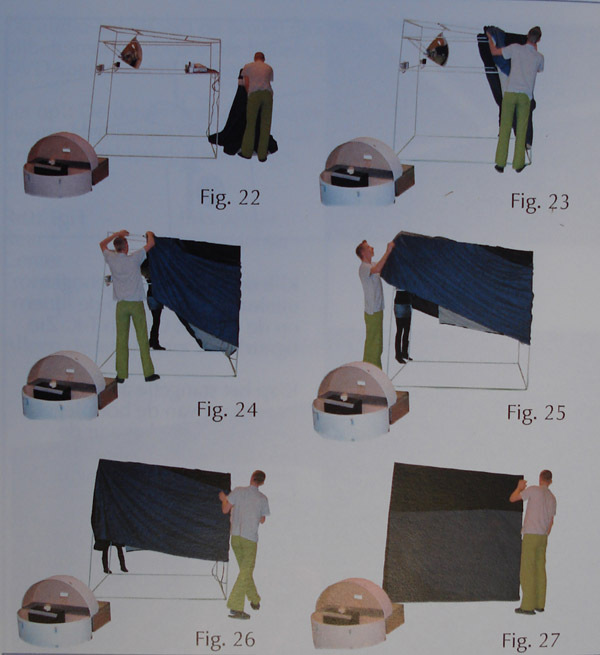 If wider wall coverage is required instead of ceiling coverage then 16:9 projectors may be more appropriate. 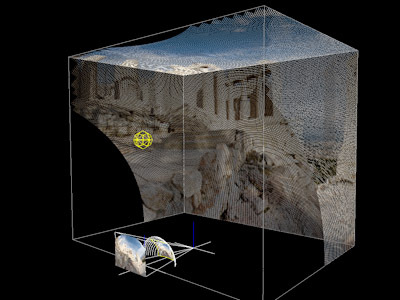 Final resolution is largely dependent upon projector resolution and therefore cost. For example: SXGA+ projections are currently about 6 times more expensive than XGA projectors for less than twice the number of pixels. 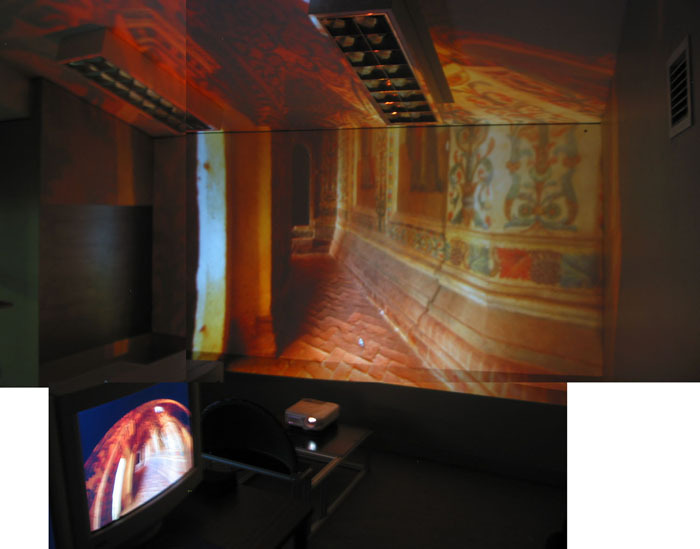 The images above are intended to show the maximum coverage possible given the particular configuration, in reality the images would be trimmed in such a way that the edge of the illuminated area on the walls were straight.....maybe. 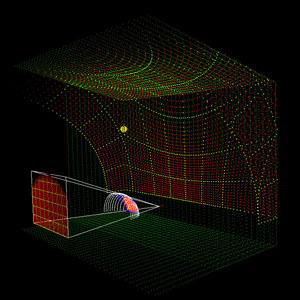 The warping mesh includes the ability to correct for brightness variation due to different light path lengths but also due to incident angle on the surface (Gouraud law). 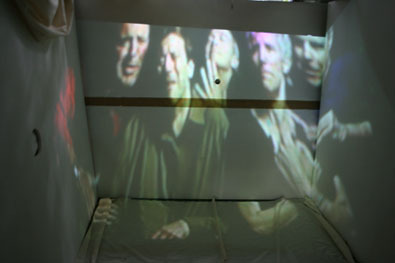 A similar arrangement is possible by mounting the projector and mirror on the ceiling, thus illuminating the floor and the walls. 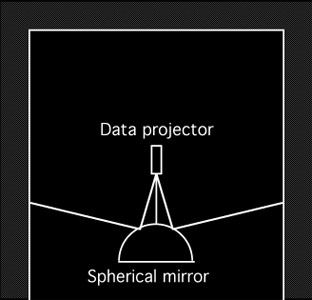 Equally, the projector mirror could be tilted to illuminate part of the ceiling and the floor. 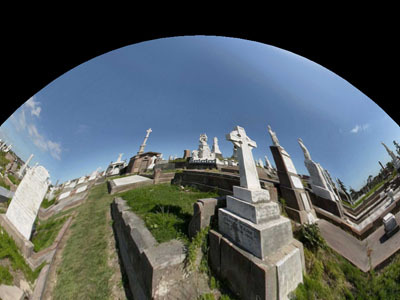 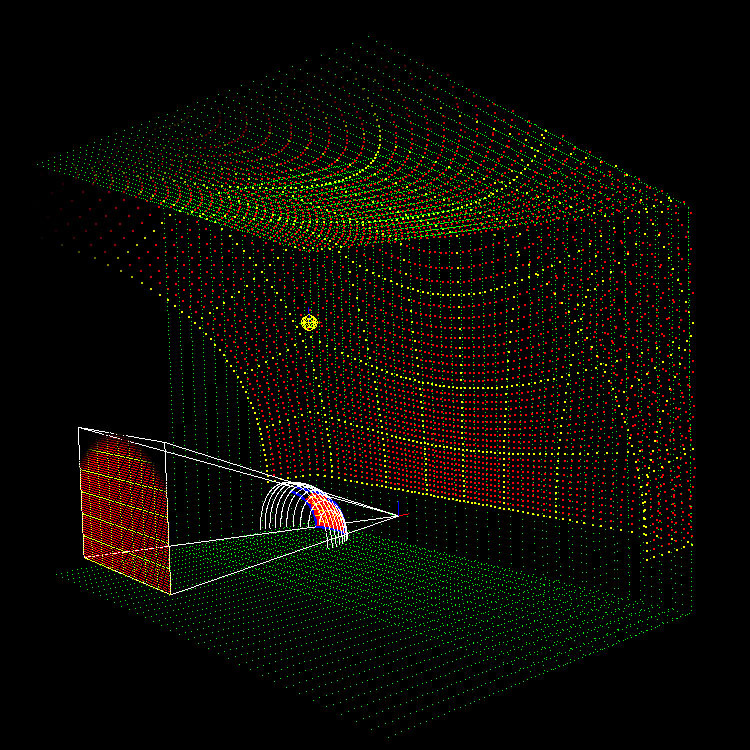 Two examples are shown below, in each case the input image is a fisheye projection. 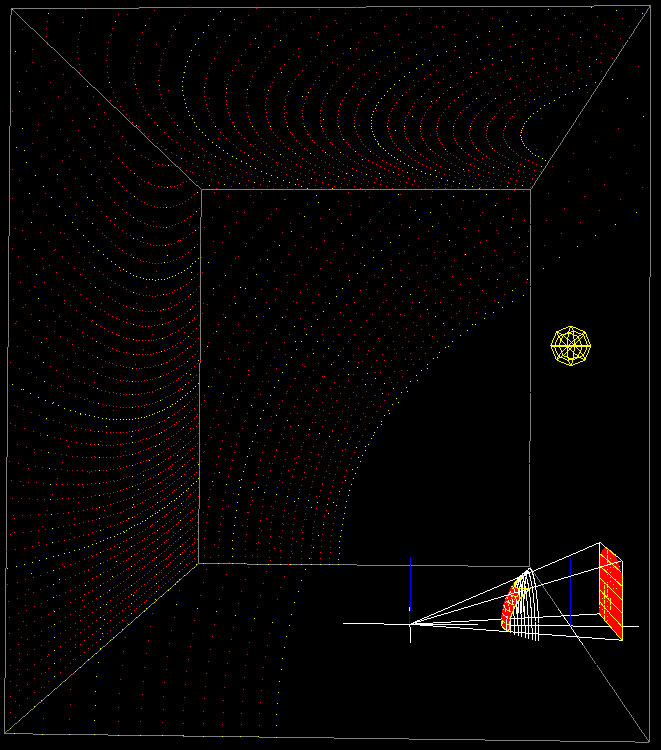 The images on the right, when projected using the mirror system would appear undistorted in the room. 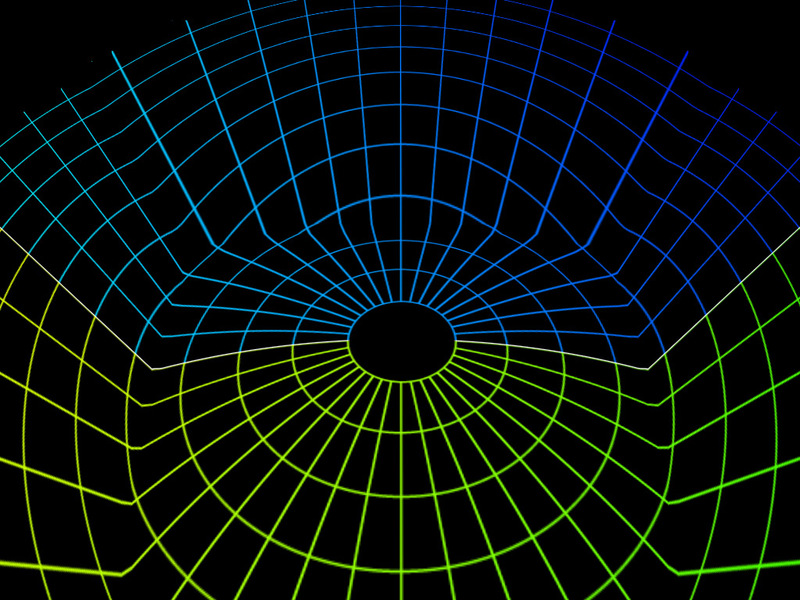 For example, the radial lines in the first example (right) would appear straight. 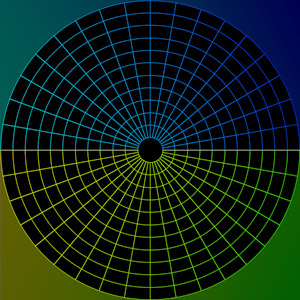 The circular lines are spaced at 7.5 degrees, so on the horizon the field of view is about 135 degrees. The view from the midpoint to the floor is about 34 degrees. 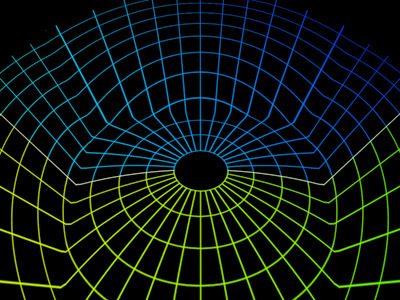 It should be stressed that almost any field of view can be achieved, the price however for a wider field of view is resolution and pixel efficiency. 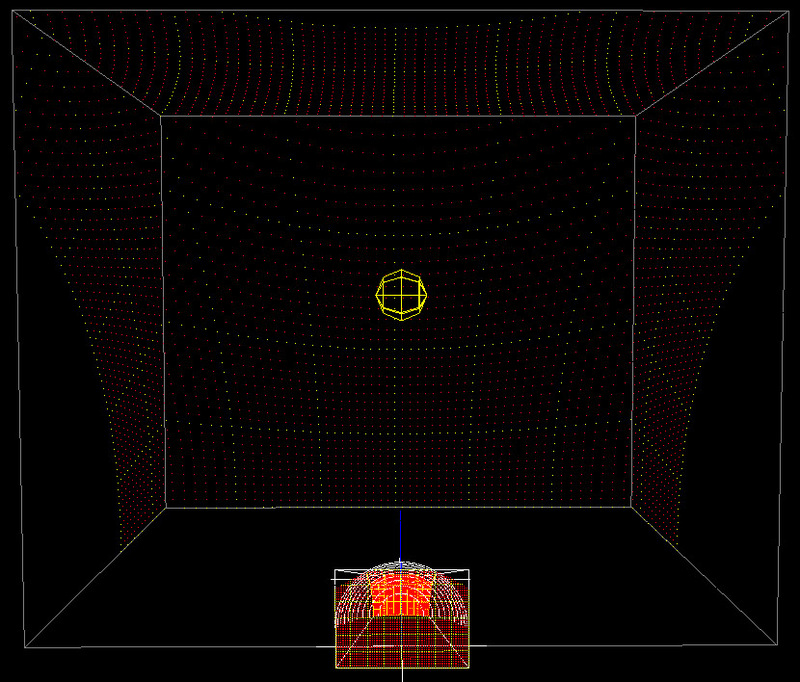 Simulation of the warped image into the environment, of course the result shown here doesn't look totally seamless across the corners of the room because this view is not located at the correct viewer position (yellow sphere). In all wide FOV immersive environments the view is only strictly correct for the observer in a single position, namely the position the scene is rendered for. 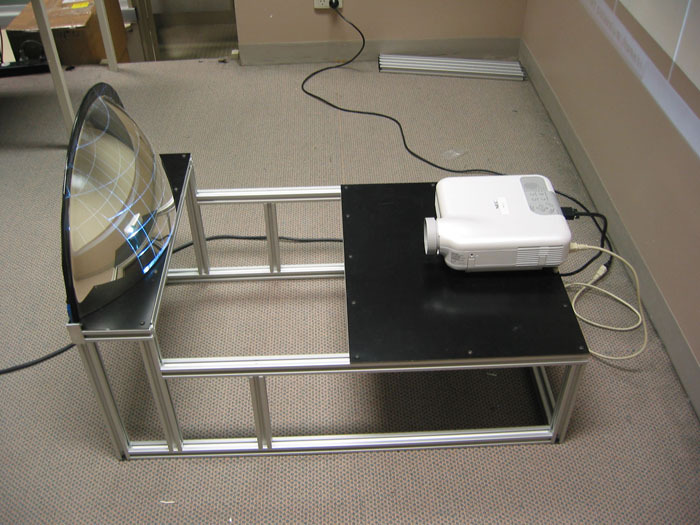 For flat screen displays we don't usually notice the distortion, perhaps because we are so used to viewing such images. 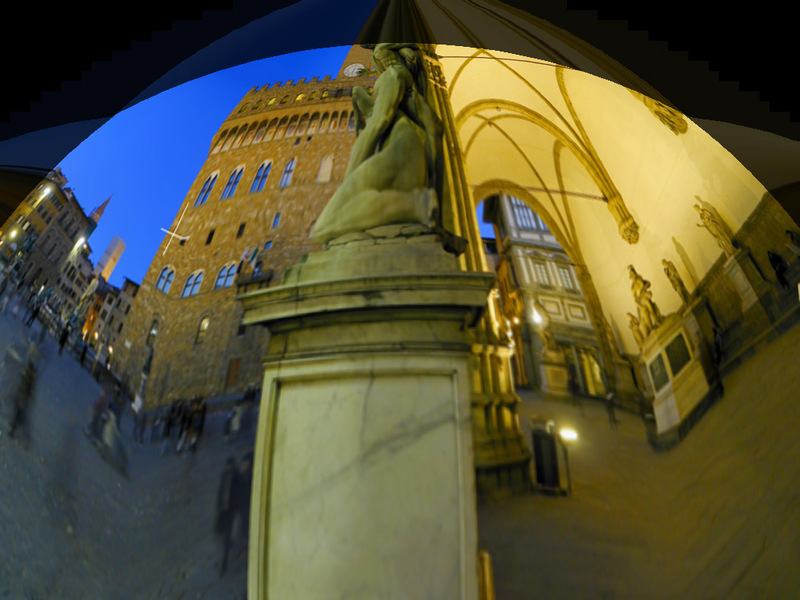 The distortion is very obvious in stereoscopic environments if the observer can move about without view frustum correction (normally using some form of head tracking). 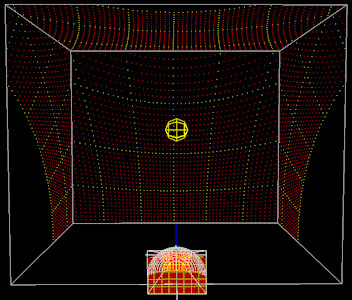 In a planetarium dome the distortion is likely to less obvious to the case here because a planetarium dome doesn't have the sharp discontinuities found in a rectangular room. 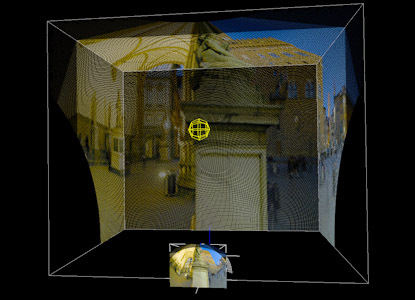 Creating a wide field of view perspective projection is likely to be easier for most existing software, however when this is extended to angles greater than 100 degrees the pixel efficiency is rather poor. 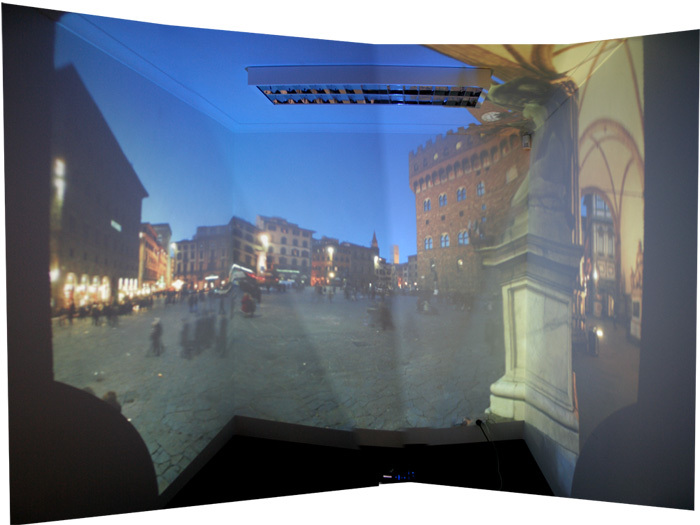 There are other projections in common usage in immersive environments, for example cylindrical projections and cubic maps. 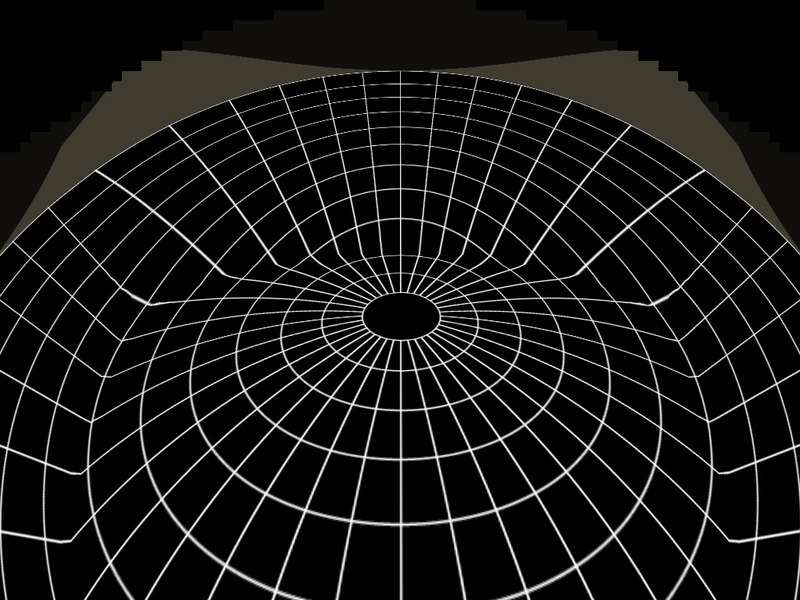 Both of these can ready be warped using the same principles used above and would be significantly better than using perspective projections. 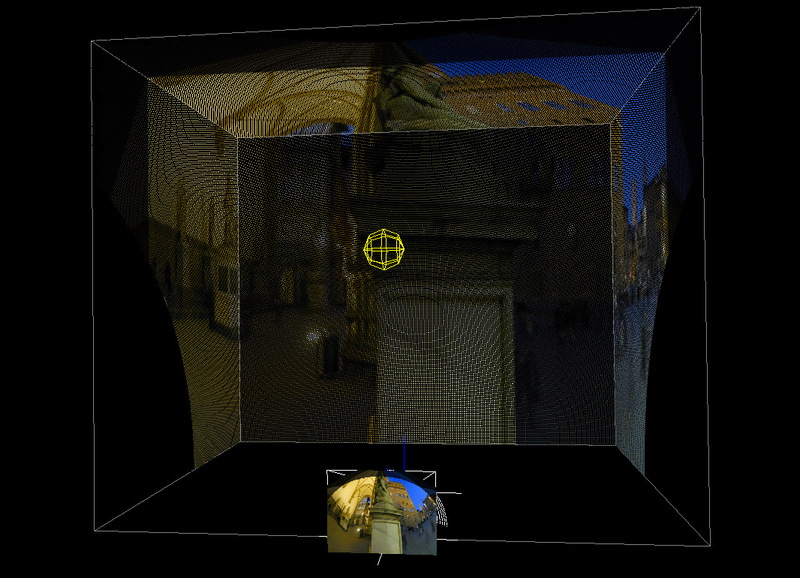 The author would recommend using cubic maps, that is, multiple passes where each one captures a 90 degree FOV. 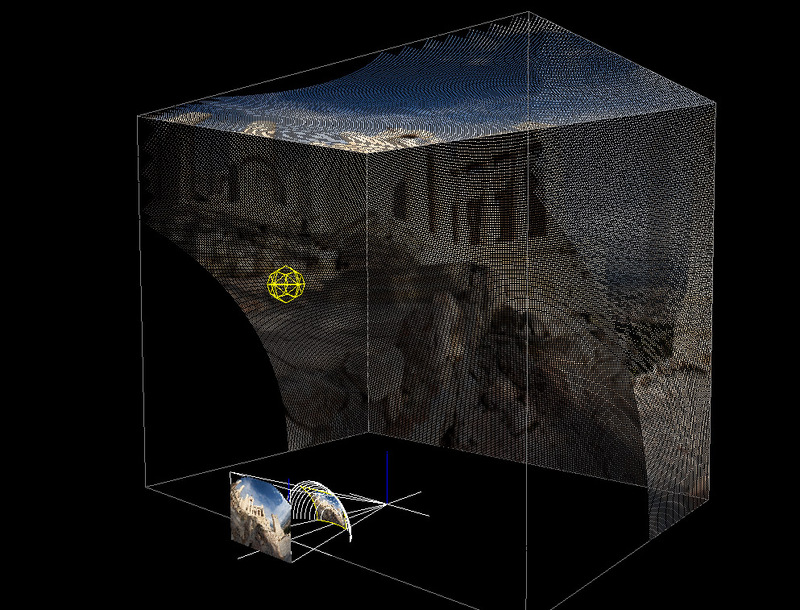 The resulting views (typically 4 from left, right, top, bottom) are each applied as a textures to a textured mesh. 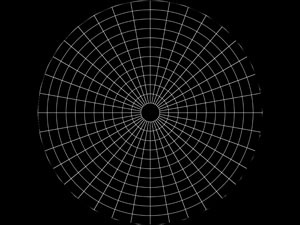 The depth of focus for a particular projector will dictate how well the images are focused across the variable light path lengths involved. 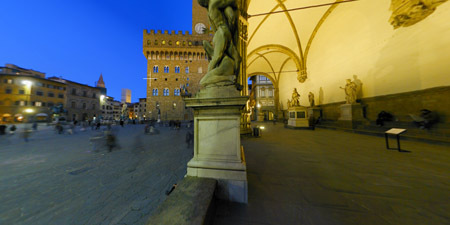 The more of the side walls illuminated, the fewer pixels are used vertically. 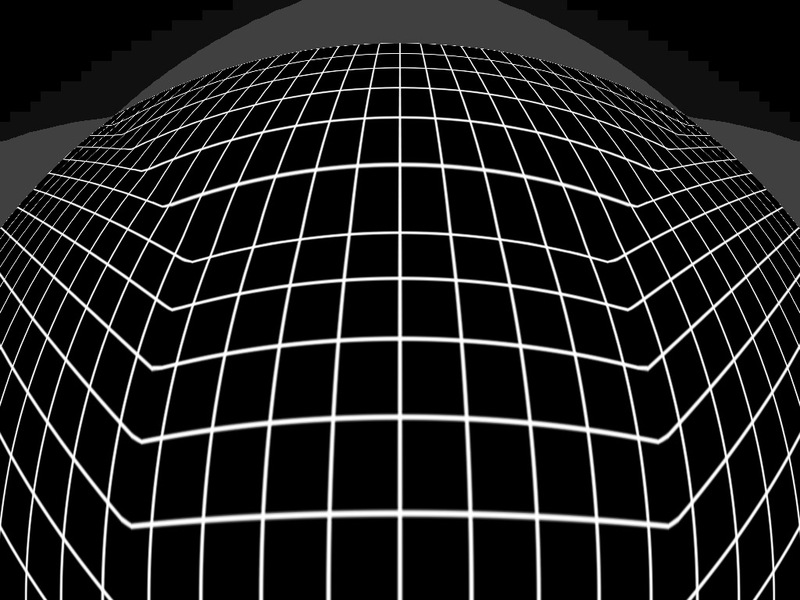 The wider the FOV the less suitable is a perspective projection as the input image. Using cubic, cylindrical, or fisheye input reduces the existing software options. 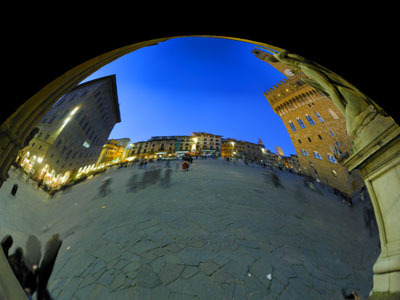 While it isn't terribly difficult to create the appropriate wide angle images using custom OpenGL code, it is rare to find such support in existing game engines. 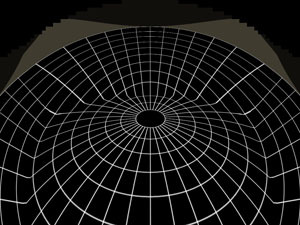 The way the warping here is applied requires that the software can render the scene in two passes, one that creates the wide field of view image (cylindrical, perspective, fisheye....) and then draw that as a texture on the warping mesh created by the simulation software discussed above. 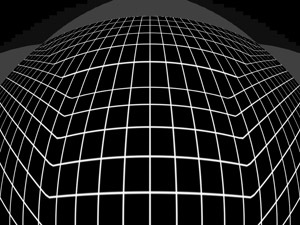 Warping pre-rendered images and movies is straightforward. 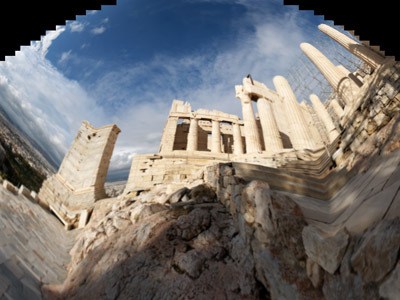 The photos here are more blurred than they appear in real life. 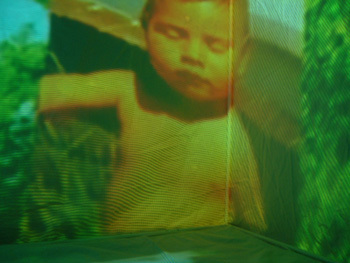 They were captured using a long exposure (it's a dark room) without a tripod. 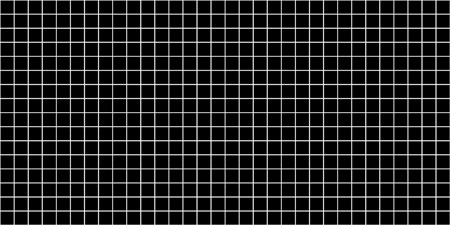 Not all straight lines that cross the corners appear straight in the photos, they do in real life. 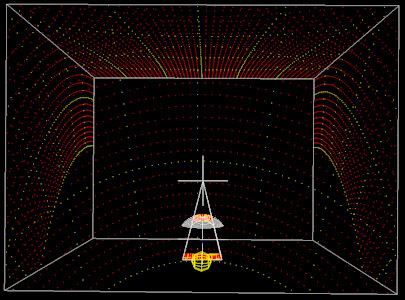 The photos were taken well away from the correct viewing position standing directly behind the mirror. 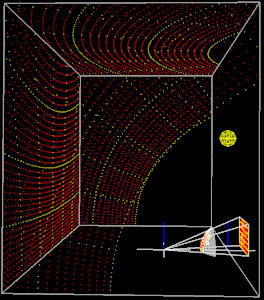 Unfortunately the wall on the left has been painted with a low gain silver paint so it doesn't reflect light very well on an angle. 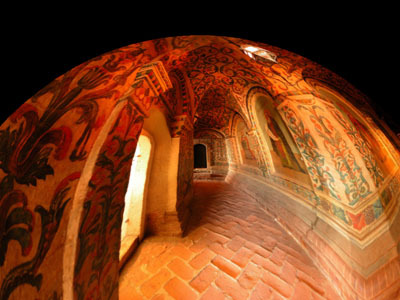 In this arrangement the wall is very long rather than squarish, as such the focus is poorer on the side walls. 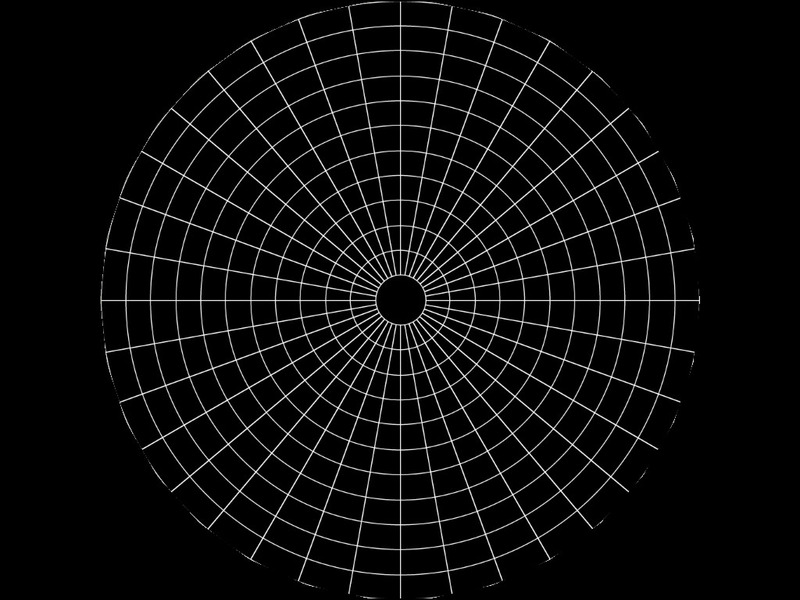 In terms of using this for immersion the out of focus region is in ones peripheral vision so not a problem at all.